Dust Control Solutions Ltd are one of the leading ventilation companies in Northern Ireland. 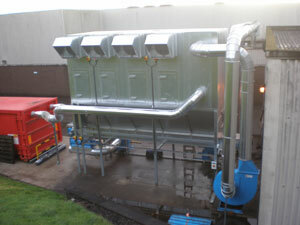 We design, manufacture and install ventilation systems for industries in Northern Ireland. Our personnel are all qualified and have extensive health and safety training providing a safe environment for all concerned. Our mission statement is to provide all of our present and potential clients, KNOWLEDGE-EXPERIENCE-SOLUTION. We provide general ventilation systems including fume cupboards that handle hazardous fumes safely. Ventilation systems that provide negative or positive systems, high pressure cooling fans working up to a pressure drop of 2,000 pa, gas turbine ventilation with all equipment and fans appropriate for operation if required up to Zone 1. Ventilation systems providing cooling air. These are systems designed to provide spot cooling for workers in extreme temperatures or environmental hazardous areas. Our service engineers are on hand 7 days per week 52 weeks in the year in Northern Ireland. If necessary we can supply temporary extraction should a serious breakdown occur.